The Cooks Next Door: Chocolate Giveaway! We couldn't have a week devoted to chocolate without a giveaway! So today, we offer a chocolate cookbook. 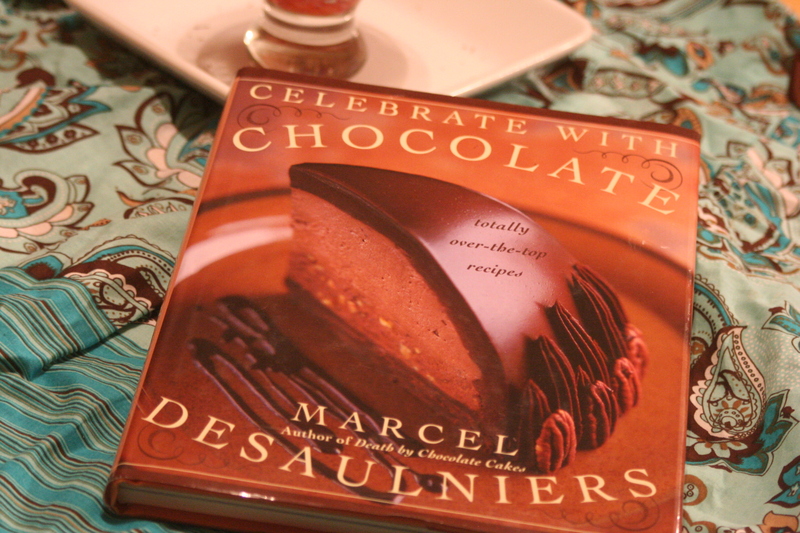 The title is Celebrate with Chocolate, by: Marcel Desaulniers (also the author of Death by Chocolate Cake). It has delightful and impressive desserts and quite a lot of information about chocolate - working with it, different types etc. There are photos of some of the recipes in the center. Just the very name of some of the chocolate creations will make you want to step into your kitchen and whip up a little something - Hot Chocolate Snow Day Cakes, Pretty in Pink Cake, Chocolate Peanut Butter & Jelly Cookies, or maybe Chocolate Grasshopper Ice Cream Sandwich. The collection of recipes includes cakes, cookies, frozen delights, and truffles. 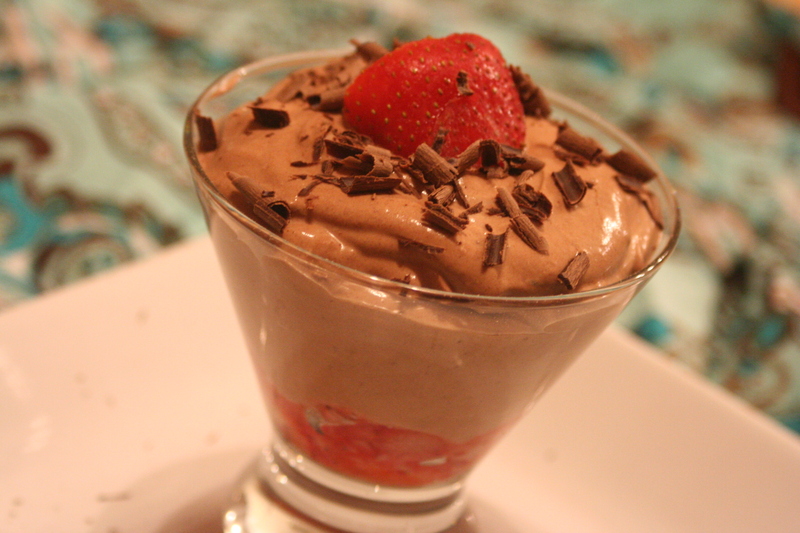 I decided to try Cocoa Berry Yogurt Mousse - it was a delicious, not-too-sweet, creamy, very easy, gluten-free dessert. We enjoyed it and concluded that it was fancy enough to be the ending to a nice dinner but simple enough to be a last minute treat for unexpected guests. Cut the berries and add sugar if using fresh to increase juiciness. If using frozen berries just thaw and use including the juices (this was what I used!). Divide between four glasses, cups, or dessert dishes. In a sifter combine the sugar and cocoa powder. Sift onto a large piece of parchment paper or wax paper and set aside. Place the heavy cream in the bowl of an electric mixer fitted with a balloon whip. Operate the mixer on low speed while gradually adding the dry ingredients; mix until incorporated, about 1 minute. Use a rubber spatula to scrape down the sides of the bowl. Now whisk on medium for 5 seconds. Remove the bowl from the mixer. Add the yogurt; fold the ingredients together with a spatula until thoroughly combined. Immediately spoon the yogurt mousse onto the strawberries in each glass. Serve immediately of cover the top of each with plastic wrap and refrigerate for up to 24 hours before serving. I garnished each dish with shaved dark chocolate and a strawberry. Delicious! 1) Leave a comment telling us your favorite chocolate dessert or kind of chocolate or your best chocolate memory. 2) Make sure we have a way to contact you! 3) You may gain an extra entry for each of the following (please tell us what you have done in your comment!) - subscribe to our feed, facebook about this giveaway, join our facebook group, or follow us on twitter. If you already do any of those, just let us know in your comment and you will get the extra entries! 4) This drawing will stay open through Tuesday, February 9. When on vacation one year in California my husband and I found this out of the way diner and they had a chocolate cate to die for. They sent a piece back with us to the hotel and well it lasted a few days it was so big. I love anything with chocolate and peanut butter together. Yum. I Fb'd this post. Hmmm my favorite chocolate dessert, there are so many! The first thing that comes to mind is a chocolate trifle. YUM!! I joined your fb group! I subscribe to your RSS feed, and I'm a member of your FB group. I married into a Christmas Eve fondue tradition, which is so much fun! Nothing beats good conversation and chocolate fondue with almond poundcake, pineapple, banana and strawberries! I love flourless chocolate cake - either with raspberry sauce, or I have made a version with ancho chili powder and cinnamon that is very good. Also, Scholars' Inn used to have an amazing chocolate pate, but sadly they don't have it on the menu anymore. When I lived in Germany I discovered Ritter Sport dark chocolate bars filled with marzipan, which are still my favorite. Ok...we follow you on twitter, I'm part of your facebook group, subscribe to your feed and have reposted the contest on my facebook feed. I'm also forcing my husband to do all of the same!!! Favorite Chocolate memory has to be the picnic basket full of chocolate stuff my friend Ruth sent with us on our honeymoon. Chocolate roses, chocolate cherry kisses, even a triple chocolate flourless cake because I was afraid to eat chocolate cake in my wedding dress! My wife made me join; she is desperate for the chocolate cookbook. I joined the blog, follow you on twitter and reposted this contest to facebook, and joined your facebook group as well. Ok ...My favorite chocolate memory was the first night my wife made dinner for me...Our first "unofficial" kinda double date with another couple from our church in Pa. She cooked entirely too much food and followed it up with this "death-by-chocolate" turtle cheese cake. Ask her for the recipe--it was phenomenal!! They say that chocolate does the same sort of things to your brain as love. I don't know about that, but she sent leftovers home with this former "bachelor geek" and we were engaged 6 weeks later! If we don't win, you have to tell me where I can find the book for her, PLEASE??? I like good, old-fashioned chocolate cake. I had an amazing chocolate latte cupcake from The Flying Cupcake today...sigh...delish. My favorite chocolate memory is when my hubby made a bunch of chocolate desserts for me for Valentine's day. He looked up recipes on the internet and made them all from scratch. I was gone for the evening and he put the kids to bed and then when I got home he served the desserts to me. It was very romantic. I joined your Facebook group and posted a link to the Cooks Next Door on fb. I have a recipe for a peanut butter chocolate cake that is so incredible! how can you pick one?! just when I think I've narrowed down a favorite, another chocolate dessert comes to mind. At this very moment, I'd really like a chocolate chip cookie. My sorority has a chocolate lovers' night every year... a fun event that we all bring something to share... there is always way way too much stuff and we eat ourselves into a stupor. Then we all work on a project for Riley Children's Hospital (so it's not all self0focused)... It's a great night. We moved this event from Feb. to April to accommodate one sister whose church does a Book of Daniel fast for Lent... she would come for the social time and never eat the chocolate. Now she can have the chocolate too! My favorite chocolate dessert is Chocolate Turtle Skillet Cake with Moose Tracks ice cream! I love Chocolate cake with chocolate icing and fudge filling. I subscribed to your feed. I thought I knew what hot chocolate was supposed to taste until I had breakfast cocoa in France last summer at a hotel. What a difference! My favorite chocolate is Cadbury chocolate - but the kind you get in the UK. I would really like to know why the US cannot produce chocolate bars as good as the whole rest of the world! I've heard we require more sugar and less fat - or I've heard that the sugar used is different. I don't know, but the international chocolate companies make their chocolate bars different for us than they do for their own countries. Cadbury here is not all that special. My hands down favorite is any type of Finnish chocolate, but especially the chocolate with bits of licorice in it. Wow. I love brownies--sinfully rich, dark chocolate, gooey brownies! Best chocolate memory is hysterical. Emily decided to have chocolate fondue while Mom and I were visiting one summer. It was heavenly, as I'd never had anything like it. We dipped chunks of pineapple, marshmallows, bits of cake, topped things with coconut, and more. Divine! But we all went crazy. It was one of the happiest, most carefree I've ever seen my mom and sister at the same time. I will never forget it! My favourite chocolate is dark chocolate or Toblerone's milk chocolate. My favourite chocolate memory is in university when my housemates and I each went to the store to buy a tub of "Heavely Hash". We all came home with our tubs and proceeded to eat only ice cream for the next 2 days as we studied for exams. I must say, I wasn't that crazy about heavenly hash ice cream for a while after that...too much of a good thing!! My husband frequently travels overseas on business and we always look forward to his homecoming and the special treats he brings us from the countries he has visited. Cadbury chocolates from the UK, "chocolate letters" which are a Dutch tradition for St. Nicholas Day, and the most exquisite chocolate I have ever tasted, Frey's chocolates from Switzerland. We have many happy memories of celebrating his homecoming with these special treats! My best chocolate memory is when I went to this cafe in Paris, France called Angelina which is the ulitimate place to get hot chocolate. Their hot chocolate is so thick you litterally have to eat it with spoon. I also got something that translated to "chocolate bomb" and it tasted as good as it sounds. I'll admit I don't remember to much about the end of the meal because I went into a sugar coma but I do remember how wonderful it was. I'm now subscribe to your RSS feed and I joined the FB group. My favourite chocolate treat is America's Test Kitchen's flourless chocolate cake. So rich and heavy you can only eat a small piece. My favorite chocolate memory was when we had a wine cheese & chocolate party recently. We bought chocolates ranging from a light milk chocolate to deep rich dark chocolate. It was so fun to experience all the different tastes and share them with friends! I already subscribe to your feed but I don't do Facebook or Twitter. Keep up the blogging! I love all the recipes and have already used some.